Google Rhin-O-Tuff, a manufacturer of paper punching and binding equipment, has experienced outstanding results from the "Go Lean" initiative that many socially responsible companies are turning to. Punch and bind equipment manufacturer Rhin-O-Tuff has completed a Go Lean assessment of its processes to dramatically reduce overhead manufacturing costs of paper punching and binding equipment while passing on savings to customers. BOISE, ID – Rhin-O-Tuff, a manufacturer of paper punching and binding equipment, has experienced outstanding results from the “Go Lean” initiative that many socially responsible companies are turning to. Since Rhin-O-Tuff is the only remaining USA manufacturer in the industry, they felt a responsibility to save manufacturing jobs in the US. Most of the company’s competitors are based in China, Taiwan, Vietnam, and Portugal where their labor costs and overhead are lower. The company realized that in order to remain competitive in equipment pricing, their manufacturing processes needed to be changed dramatically. “Rather than sending our production offshore, we decided to bring in Lean manufacturing experts to totally reinvent the way we manufacture our products. This impacted a lot of things, from the way we ordered raw materials to the actual manufacturing processes of our heavy duty punches and binding equipment,” said John Lugviel Vice President of Business Development for Rhin-O-Tuff. Rhin-O-Tuff turned to Lean industry expert TenX Ventures Senior Partners (http://www.tenxv.com/) Yosufi M. Tyebkhan and Christopher E. Wood to transform the company’s entire supply chain and manufacturing strategies. A drastic drop in the company’s inventory needs. Their finished goods and raw materials inventory saw a 60 percent decrease with work-in-progress inventory cut in half. Improved quality control and less reengineering work. Faster order fulfillment time from 10 down to 4 days. Manufacturing processes made to be reactive to new orders which in turn reduces the need to rework products that have already been boxed up and placed into finished goods inventory. Implementing the use of Single Minute Exchange Dies, reducing machine set-up time, labor hours and costs. The final result of the changes implemented was dramatic, with an overall reduction of 66 percent lower overhead costs. 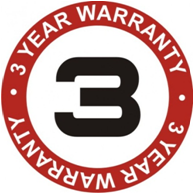 Because of improved engineering, the company is now able to increase the warranty of its equipment to an unparalleled three years, up from one year. The company’s ONYX series, which carries the three-year warranty, includes punch and bind equipment, from an automatic paper binding machine to a high-capacity coil punch machine that features twin motors that provide power for difficult jobs. For complete specifications of the entire Rhin-O-Tuff line, along instructional videos, leasing information and dealer information, visit the company website. 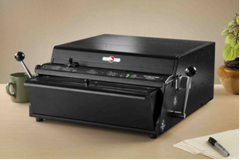 Rhin-O-Tuff offers a full range of paper punching and document binding systems. The Rhin-O-Tuff brand is known for its reliable and durable equipment that is favored by thousands of commercial and corporate users. Rhin-O-Tuff customers include small businesses that need in-house binding to large copy centers, printeries, and corporate offices who need to have binding, document finishing, or document handling solutions in-house (http://www.rhin-o-tuff.com/).